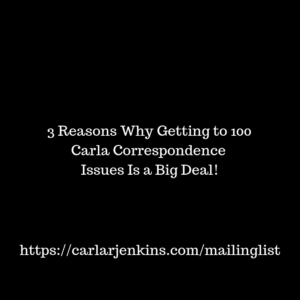 3 Reasons Why Getting to 100 Carla’s Correspondence Is a Big Deal! The 100TH Issue of Carla’s Correspondence! The newsletter that I started nearly 3 years ago just to communicate with my audience is hitting the BIG HUNDO! I cannot believe it! Here is my first newsletter dated May 30, 2016 https://ckarchive.com/b/d0ueh0hqwmp. I had all of 14 subscribers on my list (I have way more than that now!). All I wanted to do was to sell my book, Expand Your Personal Brand, and communicate on my end of the universe. Now that I am at 100, it seems like a wild journey through ups and downs yet Carla’s Correspondence still came out.